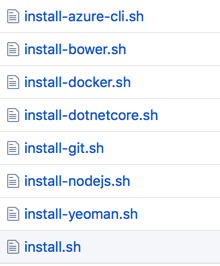 For an upcoming developer event on Docker I had to create handful of Linux Ubuntu virtual machines on Azure with Docker and few additional software installed on it. Anyways, the actual process to leverage custom extensions are rather straightforward. Create the scripts. Create the scripts and then call them in your ARM Template (which is a JSON file). Here is the complete list of software. I choose to use Ubuntu 16.04 LTS Azure Virtual Machine image so that wasn’t needed to be installed. The approach I took was to create a single script file for each one of them to keep things simple and clean. Once done with the scripts all I need to do is reference/call the install.sh script from the custom extension. Take a look at it on at line 211 in JSON. If you like to look at the code artifacts I have made them available at Git repo. You can also simply try out creating a virtual machine by single clicking “Deploy on Azure” button. You do need an active Azure subscription before you can deploy virtual machine on Azure.